Property 3: Beautifully presented private villa in beachside location, Astrakeri Beach. Property 4: Villa with sea views. Upper apartment, sleeps four. Property 6: Villa Livadi: Villa with private swimming pool garden. Luxury property. Close to Sidari. Villa Victoria - 2 bedrooms with private pool & Wi-Fi !!! Property 7: Villa Victoria - 2 bedrooms with private pool & Wi-Fi !!! Modern villa in Nissaki with 2 bedrooms, 2 bathrooms, private pool. Sleeps 6. Property 25: Modern villa in Nissaki with 2 bedrooms, 2 bathrooms, private pool. Sleeps 6. Vari Estate Ena: High Class Property With 2 Bedrooms And 2 Bathrooms In Total. SharedPool. Property 26: Vari Estate Ena: High Class Property With 2 Bedrooms And 2 Bathrooms In Total. SharedPool. Property 27: 50 Sq. M. 1 Bedroom 1 Bath unit at The Bennett Estate- Accomodates 4! 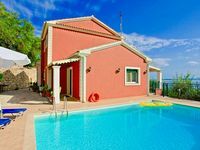 Villa Gialetti - 2 bedrooms with private swimming pool & Wi-Fi !!! Property 40: Villa Gialetti - 2 bedrooms with private swimming pool & Wi-Fi !!! Property 41: Private 3 bed villa with pool, tranquil but close to all your holiday needs. Our stay was perfect. The villa was great and view is amazing! There were some very small issues, the dishwasher was not working and there was no water coming from the pipes in the upper bathroom, but host was told about the problems, so they should be fixed for whoever visits next. Otherwise, everything was great, villa is in a great place and in October there was no one around so it was very peaceful. We loved it!